Polar bears are unable to adapt their behaviour to cope with the food losses associated with warmer summers in the Arctic. Scientists had believed that the animals would enter a type of 'walking hibernation' when deprived of prey. But new research says that that bears simply starve in hotter conditions when food is scarce. 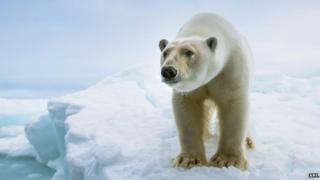 The authors say that the implications for the survival of the species in a warmer world are grim. Back in 2008 polar bears were listed as a threatened species in the US. At that time, the Secretary of the Interior noted that the dramatic decline in sea ice was the greatest threat the bears faced. Polar bears survive mainly on a diet of seals that they hunt on the sea ice - but increased melting in the summer reduces seal numbers and as a result the bears struggle to find a meal. Some researchers have argued that polar bears would deal with a reduced calorie intake by entering a low-activity state termed 'walking hibernation', similar to the way that many species of bear cope with winter. To test this idea, scientists embarked on a dangerous and expensive trial where they attached satellite collars and surgically implanted logging devices to track the bears' movements and to record physiological details. They studied more than two dozen bears in the Beaufort Sea, north of Alaska. They concluded that in the summer seasons, the bears didn't slow down, they simply starved when food was short. "Their metabolism is very much like a typical food limited mammal rather than a hibernating bear," said John Whiteman from the University of Wyoming, the paper's lead author. "If you or I were to be food-limited for weeks on end we would look like the bears' data." While the bears may not be able to change their behaviour when it comes to food, they do seem to have a significant adaption that helps them to cope with swimming in cold water. "They have this ability to temporarily allow the outermost portion of the core of the body to cool off substantially and this protects the innermost vital organs - there was not an expectation of that, it was very surprising," said Whiteman. The researchers detailed the extraordinary swimming ability of the bears in their study, with one female surviving a nine day, 400 mile swim from shore to ice. When she was re-captured some seven weeks later, the bear had lost 22% of her body mass, as well as her cub. The scientists say that despite this strong performance in cold water, it doesn't compensate for the lack of food and the inability of the bears to slow down their metabolism in response. "We've uncovered what seems to be a fascinating adaptation for swimming in cold arctic waters, but I don't think that is going to play as big a role in determining their fate as the loss of hunting opportunities will," said Whiteman. "We think this data also points towards their eventual decline." "The cost was extremely high for such a study but our results are indisputable so I doubt anyone will feel the need to repeat this," said Prof Merav Ben-David, from the University of Wyoming, another author. The paper has been published in the journal Science.